I still remember old school door-to-door salesmen coming by when I was a little kid. They had big suitcases that unfolded into a miniature store display. The only thing that I can specifically remember my mom getting was a pair of Superman dolls for me and my brother. I wonder if she ever got any of the classic stuff like a vacuum cleaner or spatulas. IT’S NOT A DOLL! IT’S AN ACTION FIGURE!!! I’ve never seen them. I’ve known of a milkman who passed by every day, but he didn’t try to sell his milk. He just sold it. If you catch my drift. It takes persistence to sell hay-loading doors in this day and age. *This was way back in the 1960s when they still did that sort of thing. Door-to-door Kirby Vacuum salesman when I was a kid. No sale, though. Never did get to see a Fuller Brush salesman. Door to door potato chips and cookies. Charles Chips man we miss you. We bought chips in giant tins that musta held about 20 gallons if you filled them with water. How did we go through so much? 5 kids, that’s how. We had a woman who would come round my nans selling seafood, the crab lady strange thing was i have no idea where it came from. I had some old roommates who started selling Kirby’s door to door a few years back. Hard work for shat money, I was only making $200/ week at the time and I was the only one bringing in a steady paycheck. Girl Scouts definitely don’t count as door-to-door salesmen, namely because most of them just get their parents to guilt their co-workers into buying insane amounts. I knew a guy that went door to door selling some kind of carpet steamer thing. He said their basic sales pitch was to get the person to let them clean a small patch of carpet to demonstrate.. but only the small, very visible patch in the center of their living room. One guy threatened to call the cops if he didn’t clean the rest of his living room carpet. Apparently some ladies tried to pay in the horribly stereotypical male fantasy style. I don’t know if I believe the latter.. though he was really, really pretty. Biff must be a great jumper. Thanks. Now only 3 more Birthdays and I should have all four. But by then you will have well over 4 out. 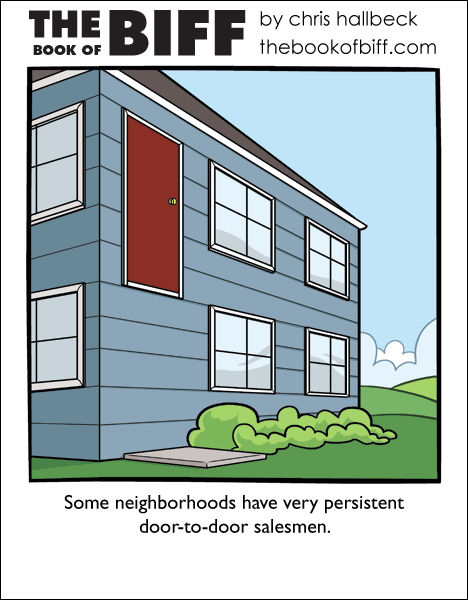 On the topic of this comic I have found door to door sails man don’t really exist any more. Although one of the characters from my game has a rocket powered flying house for among other reasons this same reason. …This wont deter the elevator salesman. I know from experience. This reminds me of Secondhand Lions. Actually, knowing Biff, he just charges the wall.